Background: Fungal infections have been causing serious problems in all age groups, especially in immune-compromised individuals. Various synthetic agents are in clinical practice for the treatment of these infections, however, resistance to these agents badly affected their therapeutic quality. Objective: This review focuses on the antifungal activity of naturally occurring alkaloids, their source, chemical structure, and potency with a possible mechanism(s) of action. Results: The results of available literature showed that at least 70 different plant derived alkaloids exhibited antifungal activity in vitro. These alkaloids are isolated from different plants and families showing their diverse distribution in plant kingdom. Additionally, the alkaloid from various classes depicted antifungal effects against a variety of fungi. Conclusions: Alkaloids could be a better therapeutic alternative to available therapies with fewer chances of resistance but more research and clinical trials are needed before final recommendations. 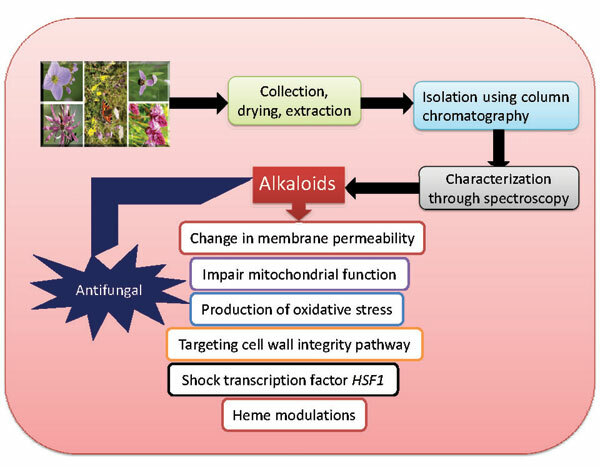 Additionally, the details provided in this review will offer greater awareness of the excellent promise that natural alkaloids exhibit as antifungal agents. Keywords: Alkaloids, antifungal activity, structure and potency, antifungal agents, mechanisms, alternative medicine, drugs of future. Keywords:Alkaloids, antifungal activity, structure and potency, antifungal agents, mechanisms, alternative medicine, drugs of future. Abstract:Background: Fungal infections have been causing serious problems in all age groups, especially in immune-compromised individuals. Various synthetic agents are in clinical practice for the treatment of these infections, however, resistance to these agents badly affected their therapeutic quality.